Bottom club Burton Albion remained four points from safety in the Championship after a low-quality draw at Ipswich. The hosts failed to register a shot in a turgid first half, with neither keeper needing to make a save. 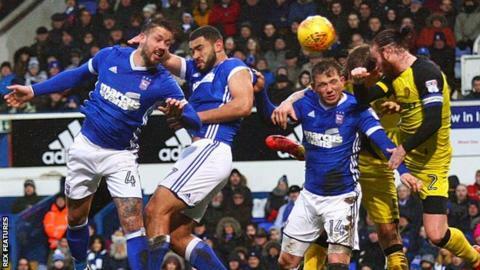 Former Ipswich striker Darren Bent could have broken the deadlock for the Brewers but saw his shot blocked by the legs of goalkeeper Bartosz Bialkowski. Bialkowski was forced into another top save late on when he tipped Kyle McFadzean's near-post header over. Mick McCarthy's Tractor Boys stay 12th, eight points from the final play-off spot, following a limp display which saw them have their only attempt on target in the 85th minute. McFadzean's 90th-minute header came from Martin Samuelsen's corner, while ex-England international Bent should arguably have opened his Burton account when John Brayford sent him through on goal. Ipswich showed small signs of improvement after Mustapha Carayol was introduced off the bench for his debut, but he could only find the side-netting from 25 yards. "It's probably the worst game here all season. It was tough and maybe the opposition had a bearing on that. "We did not play well at all and they made it really hard for us. "A lesser together committed bunch of lads could have been beaten. "Nigel's team acquitted themselves well and you have to give some credit to them. It was a poor performance by us." "It's two points dropped and the performance deserved the three points. "To play as well as we did in two games and only get one point is very harsh on us, but it was nice to keep a clean sheet. "The nicest thing is that we are not playing like a team at the bottom of the league and we will try that until the end of the season - but what will be will be. "We tried to win the game right up to the last minute and couldn't have done any more apart from score." Match ends, Ipswich Town 0, Burton Albion 0. Second Half ends, Ipswich Town 0, Burton Albion 0. Mustapha Carayol (Ipswich Town) wins a free kick on the left wing. Corner, Burton Albion. Conceded by Bartosz Bialkowski. Corner, Burton Albion. Conceded by Jonas Knudsen. Corner, Burton Albion. Conceded by Cameron Carter-Vickers. Liam Boyce (Burton Albion) wins a free kick on the right wing. Offside, Ipswich Town. Joe Garner tries a through ball, but Bersant Celina is caught offside. Attempt saved. Bersant Celina (Ipswich Town) right footed shot from outside the box is saved in the centre of the goal. Martin Samuelsen (Burton Albion) wins a free kick in the defensive half. Attempt missed. Cameron Carter-Vickers (Ipswich Town) header from the centre of the box misses to the left. Assisted by Martyn Waghorn with a cross following a corner. Corner, Ipswich Town. Conceded by Kyle McFadzean. Substitution, Burton Albion. Marvin Sordell replaces Lloyd Dyer. Attempt missed. Mustapha Carayol (Ipswich Town) left footed shot from outside the box is close, but misses to the right. Assisted by Stephen Gleeson. Corner, Burton Albion. Conceded by Mustapha Carayol. Attempt blocked. John Brayford (Burton Albion) right footed shot from outside the box is blocked. Assisted by Jacob Davenport. Foul by Martin Samuelsen (Burton Albion). Substitution, Burton Albion. Liam Boyce replaces Darren Bent. Attempt blocked. Jacob Davenport (Burton Albion) left footed shot from outside the box is blocked. Assisted by Hope Akpan. Joe Garner (Ipswich Town) wins a free kick on the right wing. Joe Garner (Ipswich Town) wins a free kick in the attacking half. Attempt missed. Martyn Waghorn (Ipswich Town) left footed shot from outside the box misses to the left. Assisted by Cole Skuse from a direct free kick. Mustapha Carayol (Ipswich Town) wins a free kick on the right wing. Substitution, Ipswich Town. Mustapha Carayol replaces Grant Ward. Substitution, Ipswich Town. Stephen Gleeson replaces Callum Connolly. Attempt saved. Darren Bent (Burton Albion) right footed shot from the centre of the box is saved in the bottom left corner. Assisted by John Brayford. Attempt saved. Darren Bent (Burton Albion) right footed shot from the left side of the box is saved in the centre of the goal. Assisted by John Brayford with a headed pass.